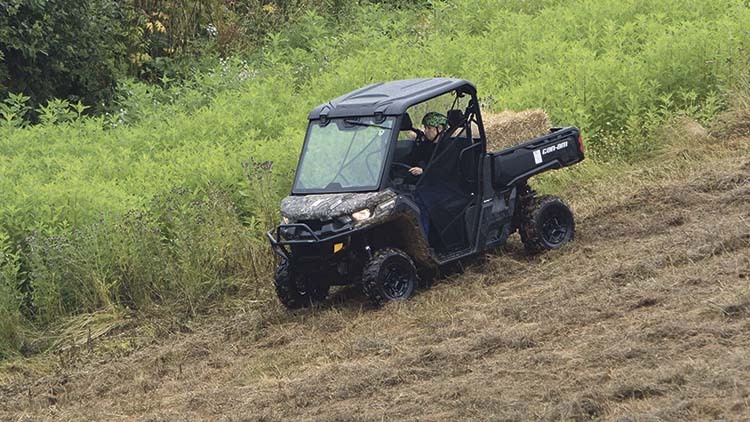 With the latest Can-Am Defender side-by-side vehicle, BRP continues its foray into the utility market. To find out how it performs, Jane Carley gets behind the wheel. The Can-Am Defender has been updated with a more powerful engine and more substantial build. To get a flavour of Can-Am’s latest side-by-side vehicles, we tested the smaller of its two Defender models in the range. 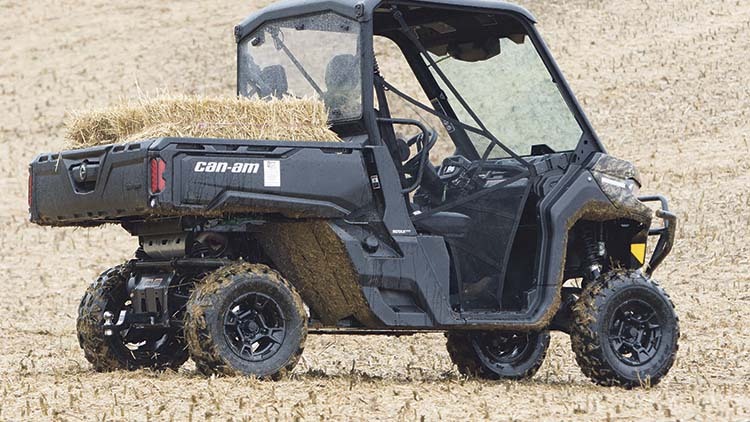 Take a look at Can-Am's latest utility products. Power comes from sister firm Rotax’ 50hp HD8 799cc petrol engine, although there is a 72hp HD10 976cc version available. To match the requirements of the Defender, the engine has been recalibrated to give 68Nm of torque. Even without much of a load on board you can feel its pulling power climbing a steep bank. The Defender can also burn rubber when required. In common with a couple of other manufacturers, Can-Am offers programmable digitally encoded security system keys. As well as providing a useful anti-theft function, these keys allow the top speed to be limited to 40 or 77kph, handy if you have boy racers among your staff. 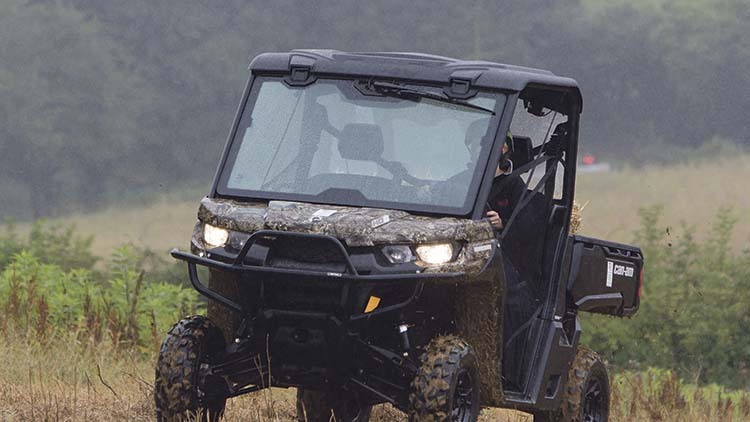 Parent company Bombardier Recreational Products (BRP) claims its Defender features a new, laser-cut, tongue-and-groove chassis with automotive-like technology and fabrication tolerances aligned with modern pick-up trucks. Visually, it is a solid chunk of a vehicle, constructed from high-strength, low-alloy grade steel, but also deceptively compact to easily work round buildings or squeeze along tight headland margins. Double A-arm suspension with gas shocks in front, plus plenty of ground clearance improves performance on rough ground. Manoeuvrability is greatly aided by the firm’s Dynamic Power Steering fitted to the Defender DPS model on test, giving it a nifty turning circle and making steering a breeze even with the diff lock on. Selectable two/four-wheel drive is complemented with an auto-locking front and electronically lockable rear differential for traction and grip, though you may rarely need four-wheel drive unless you live in a bog. With the rear diff locked, the front differential sends more power to the opposite wheel if a front wheel loses traction, doggedly maintaining progress up a greasy hill. Electronic hill descent control was effective on some modest banks and is backed up by disc brakes should things get really hairy. Electronic hill descent control is backed up by disc brakes should things get really hairy. The continuously variable transmission incorporates the park brake into the main selection grid, along with high and low ranges, neutral and park. Shifts are good and the Defender with happily trek up hill and down dale in high range, even in wet or muddy conditions. 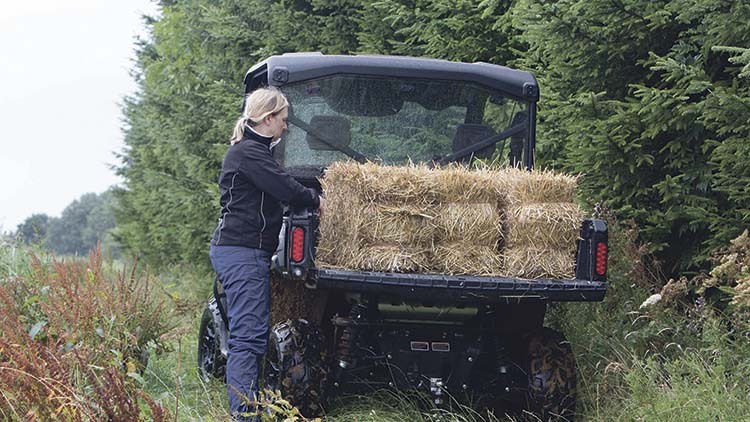 Ground clearance is a generous 28cm and, with heavy-duty torsional trailing A-arms at the rear plus double A-arm suspension with gas shocks up front, it should handle rougher terrain than the just harvested field and border strips in our test. Cargo box capacity is 454kg and an automotive style tailgate makes for easy loading. There are stacks of accessories available, including a bed wall extender to make shifting bales or loose materials easier. Cargo box capacity is 454kg and an automotive style tailgate makes for easy loading. The cab is spacious and intensely practical, with tip-up passenger seats making more space, along with numerous cubby holes. A clever slot-in removable toolbox can be specified as an option. Standard colour for this version is camo, the more basic version without power steering comes in plain khaki. The Defender’s petrol power unit remains as the elephant in the room and many farmers find buying and storing unleaded too much of a faff. 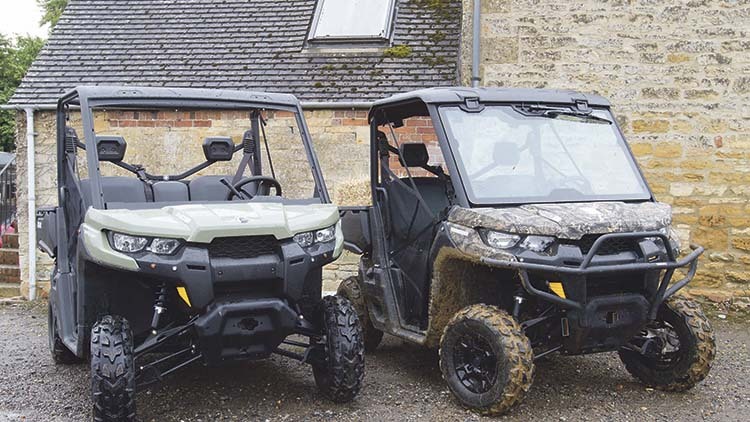 Parent company BRP has produced figures in the past showing running costs for petrol UTVs compete well with diesel, and if customers can get over the fuelling inconvenience, this is a nifty addition to the list of UTV choices. As well as the DPS power steering version, the Defender is also available in a base model. A six-seater, double cab version is also available.